Among the overall public, 53% now express approval of the way Barack Obama is handling his job as president. About four-in-ten (42%) disapprove. This is little changed from June, before the party conventions, when 50% approved and 44% disapproved, but his rating over the last several months remains significantly higher than in recent years. As has been the case throughout his administration, perceptions of how Obama is handling his job are divided along party lines. Nearly nine-in-ten Democrats (88%) approve of Obama’s performance, while only one-in-ten disapprove. The inverse is true for Republicans: 13% approve and 85% disapprove of the way Obama is handling his job. For the first time in more than three years, Obama’s job rating is now in positive territory among independents. Today, 53% of independents approve of Obama’s job performance, while 40% disapprove. In June, independents were divided in their assessment of his performance (46% approved, 46% disapproved). The last time independents rated Obama’s job performance in positive territory was in December 2012, shortly after his reelection (when 53% approved and 39% disapproved). 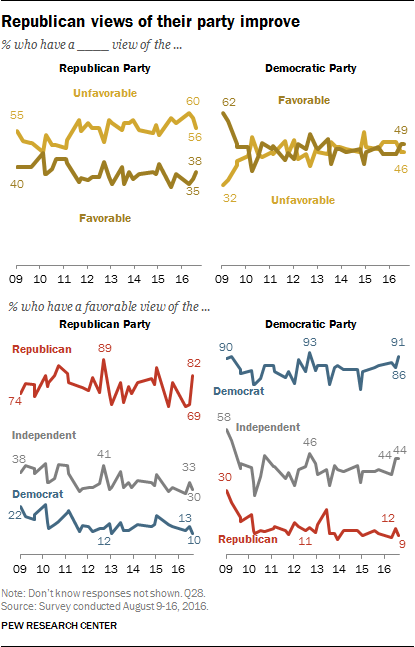 By a 56% to 38% margin, the Republican Party is viewed more unfavorably than favorably among the public. By contrast, about as many view the Democratic Party favorably (49%) as have an unfavorable opinion (46%). Republican assessments of the GOP have ticked up in recent months. About eight-in-ten (82%) Republicans today have a favorable opinion of their party, up from 69% in June. Independent and Democratic views of the GOP are little changed in recent months. Democrats continue to hold highly positive views of their party: 91% have a favorable opinion of the party. And independents’ ratings of the Democratic Party remain more positive than those of the Republican Party (44% vs. 30%).